Background: Eukaryotic cells release vesicles of different sizes under both physiological and pathological conditions. On the basis of the respective biogenesis, extracellular vesicles are classified as apoptotic bodies, microvesicles, and exosomes. Among these, exosomes are considered tools for innovative therapeutic interventions, especially when engineered with effector molecules. The delivery functions of exosomes are favored by a number of typical features. These include their small size (i.e., 50-200 nm), the membrane composition tightly similar to that of producer cells, lack of toxicity, stability in serum as well as other biological fluids, and accession to virtually any organ and tissue including central nervous system. However, a number of unresolved questions still affects the possible use of exosomes in therapy. Among these are the exact identification of both in vitro and ex vivo produced vesicles, their large-scale production and purification, the uploading efficiency of therapeutic macromolecules, and the characterization of their pharmacokinetics. 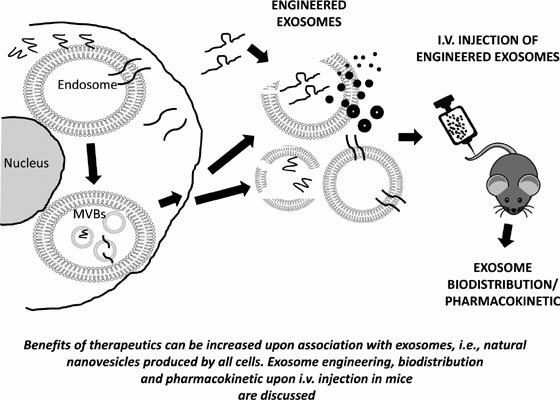 Objective: Here, we discuss two key aspects to be analyzed before considering exosomes as a tool of delivery for the desired therapeutic molecule, i.e., techniques of engineering, and their in vivo biodistribution/ pharmacokinetics. In addition, an innovative approach aimed at overcoming at least part of the obstacles towards a safe and efficient use of exosomes in therapy will be discussed. Conclusion: Several biologic features render exosomes an attractive tool for the delivery of therapeutic molecules. They will surely be a part of innovative therapeutic interventions as soon as few still unmet technical hindrances will be overcome. Exosomes, biodistribution, pharmacokinetics, RNA delivery, chimeric proteins, multivesicular bodies.